A steal of a deal on a proven .40 S&W ammo specifically made for duty/defense. 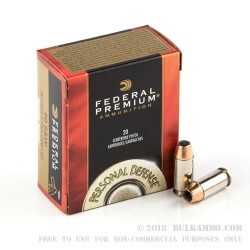 The Federal Premium Personal Defense line offers the best of the stopping power of the Hydra-Shok and the best of the production capabilities and quality control of the Federal production process. 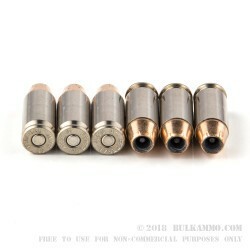 The Personal Defense line features creature comforts like Nickel plated brass for enhanced feeding and extraction with boxer primers for easy reloading and the obvious stopping power of the Hydra-Shok projectile which has proven itself time and again in duty conditions to be a powerful threat stopper. The 180 grain projectile is slower than other grain weights but offers suitable penetration and good hard nosed energy transfer – in this case to the tune of 400 ft. lbs of energy out of the barrel. A velocity of 100 feet per second helps to even out the penetration numbers and the uniformity of expansion with the Hydra-Shok engineering which improves the stopping power of the .40 S&W. Premium powders offer a high level of burn rate and leaves little residue in your firearm. Federal’s factories produce ammunition to a standard specification that can bee seen in their retail products. In the case of the Federal Personal Defense, this is at the highest level and helps to produce a round that many lives depend on day in and day out. 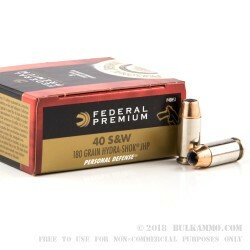 Q: The Federal .40 Hydra Shock is my personal favorite JHP and is what I use in my home defense gun. I noticed a while back that when looking inside of the “soup bowl” at the tip of the round, there is a small rod/pin looking object inside the middle of the round. 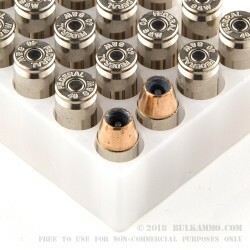 Can you tell me what that is and how it functions in the hollow point expansion process? Thank you. A: The post inside the hollow point does not have an effect on whether or not the hollow point will expand. It is simply a part of the core that is designed to collapse after impact. Earlier Hydra-Shok bullets had posts that would not collapse, which resulted in less tissue damage and overpenetration.